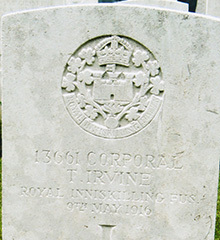 Thomas Andrew Irvine was the son of John James and Eliza Anne Irvine of Ranenly, Fivemiletown, County Tyrone. Thomas was born about 1894 in Ranenly, Fivemiletown. The 1901 census records Thomas as 6 years old. He was living with the family at Ranenly, Fivemiletown, County Tyrone. His father was a farmer. The 1911 census records Thomas as 17 years old. His occupation was described as farmer’s son. Corporal Thomas A. Irvine was serving with the 9th Battalion of the Royal Inniskilling Fusiliers when de died on 9th May 1916, age 22. Beauval is a village on the main road (N25) between Amiens and Doullens, about 24 kilometres north of Amiens and 6 kilometres south of Doullens. Beauval Communal Cemetery is on the northern side of the village at the end of a by-road leading off the main road - Rue de l'Eglise. 4 War Graves Photographic Project Photo of Thomas Andrew Irvine's headstone can be purchased here.